Google and Paramount Pictures are joining forces to let U.S. and Canadian viewers rent 500 movies on the YouTube Rentals service and Google Play. The partnership may seem a little strange since Google and Paramount's parent company, Viacom, are still embroiled in a major copyright lawsuit. Google won a major battle (if not the war) when a federal judge ruled in June 2010 that YouTube was protected under U.S. copyright law. Viacom, looking for more than $1 billion in damages for alleged copyright infringement, has appealed the ruling. 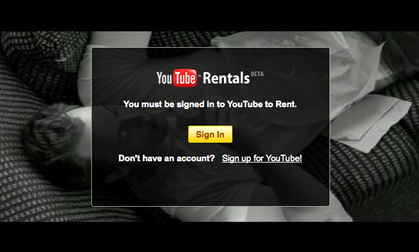 A quick scan of the YouTube Rentals homepage suggests the cost per video rental can range from $0.99 to $19.99, though Google says new movies will be $3.99 and older ones $2.99, and that most rentals will be for 24 hours. According to Google and Paramount's press release, the list of movies includes newer stuff like Captain America, Hugo, and The Adventures of Tintin, as well as older fare such as Coming to America and The Godfather. Paramount is the fifth Hollywood major to partner with YouTube, leaving News Corp's 20th Century Fox the only major studio left to sign a deal, after Disney, Sony, Universal, and Warner Bros. You can rent videos from all six studios through Apple's iTunes Store already, so it's probably just a matter of dotting some i's and crossing t's before the final holdout comes over. Google notes that it also has deals with more than 10 independent studios, including Lions Gate Films, Magnolia, Starz and Weinstein.